The individual store data can be exported by opening the store location in the editor and click on ‘Export Location Data’ ( right bottom corner ). This will generate a CSV file with all the related metadata ( name, address, coordinates, contact details and possible custom fields ). Both the Search Widget and CSV Manager itself don’t collect any personal data. Loading the Google Maps library normally happens automatically in the background, but this can be prevented in combination with the Borlabs Cookie plugin. After you installed the Borlabs Cookie plugin you need to take three steps to make it work with the WP Store Locator plugin. In the admin area go to Settings > Borlabs Cookie and check the “Activate Borlabs Cookie” checkbox. On the WPLS settings page scroll down to the “Tools” section. 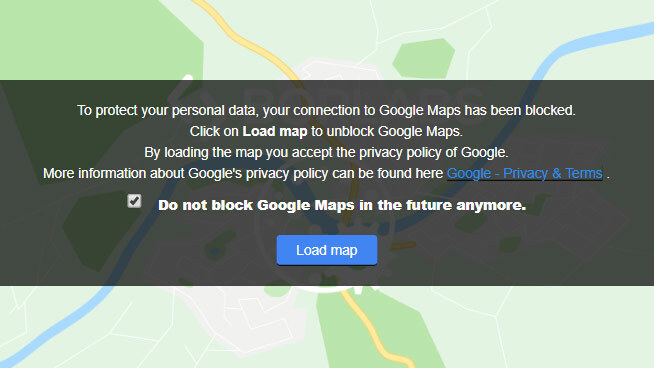 There enable the “GDPR – Only load Google Maps after the user agrees to it?” option. The last thing you need to do is open the store locator page in the admin editor, and replace the [wpsl] shortcode with the code below. This tells the Borlabs Cookie plugin to prevent the loading of Google Maps scripts for the store locator. If everything is setup correctly, then you should see the image below instead of the store locator. Only after the user clicks on “Load map” is the Google Maps library loaded and the store locator shown.